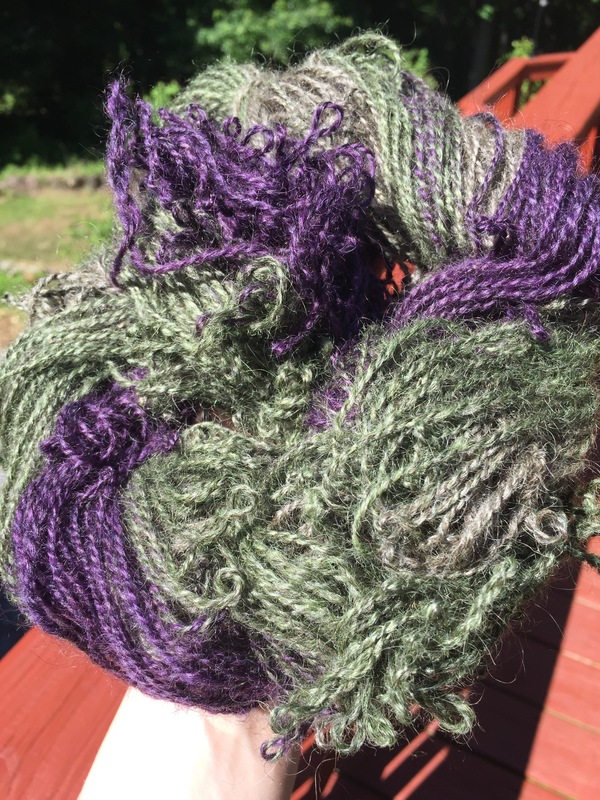 I spun the Gotland the day after I posted that last post about the BFL, but I didn’t finish it before we moved onto our next leg of vacation, so here it is nearly three weeks later. I was inspired by Rachel’s live stream video last night (I won some stitch markers! Woo! ), so I thought I’d finish it up while my thoughts of spinning it are refreshed in my mind. Forgive the casual style; I’m dictating this to my phone while taking a walk through a sunny neighborhood! I might forget a few pieces of punctuation. Same prep, same dye, same dyer. The only difference between this batt and the last is fiber, and both are longwools. But in these same hands on the same wheel, Gotland is a very different spin. BFL is a longwool in that is a relatively long staple, but it’s on the fine side, and very smooth. Or maybe I’m just used to spinning it. Katrina’s prep was light and airy and spun like butter. The Gotland was an entirely different experience. I had never heard of Gotland before this year, but now I’m seeing it everywhere. It’s got this shiny mohair quality, is very hairy, and only comes in grey. Its most recent claim to fame is that it was used to make the elven cloaks for the Lord of the Rings movies. If a wool can convincingly pretend to be from Rivendell, it’s got a place in my heart. 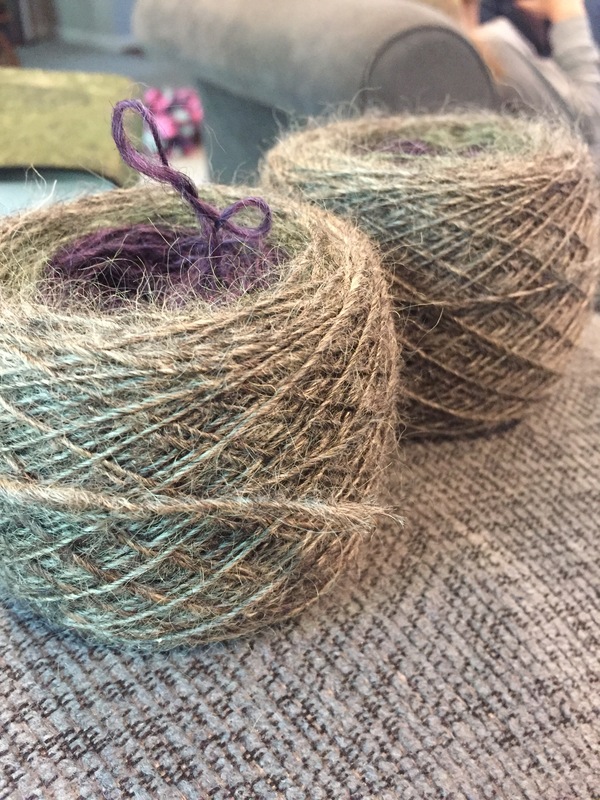 It’s decidedly a longwool, in terms of strength (meaning the thickness of actual fibers, since it’s not PC to say “coarse”), and length of fibers. I don’t have a lot of experience to compare it with other longwools; I’ve only spun Dorset and Wensleydale out of the longwool type. But it seemed different. Quite different. I wonder if somehow the Gotland just has more open scales? That would account for the softness and the stickiness. I’m so glad it was a carded prep, since that opened it up a bit; I imagine a compressed commercial top would have me fighting with it even more. There was another weird thing that kept happening to me. 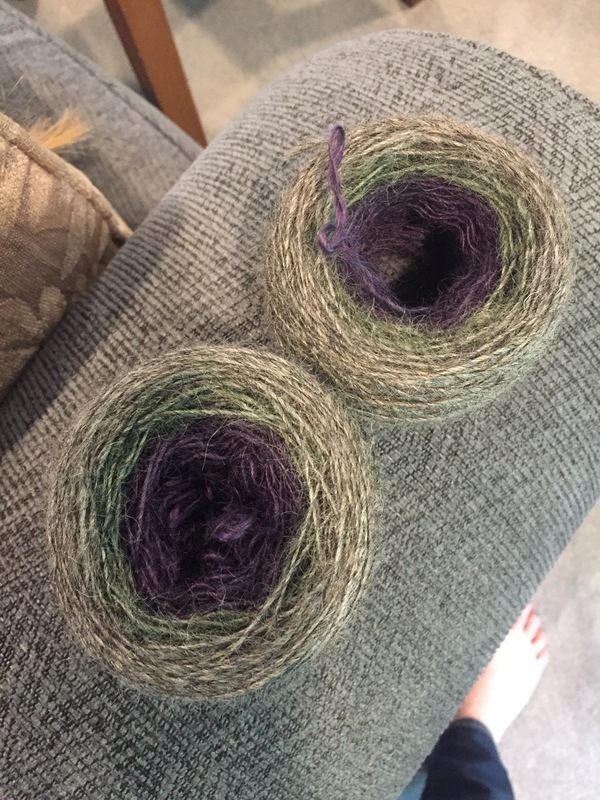 I was trying to match the same singles sample as the BFL, because I wanted to spin basically the same yarn in the two fibers. But I kept spinning thicker than I thought I was. 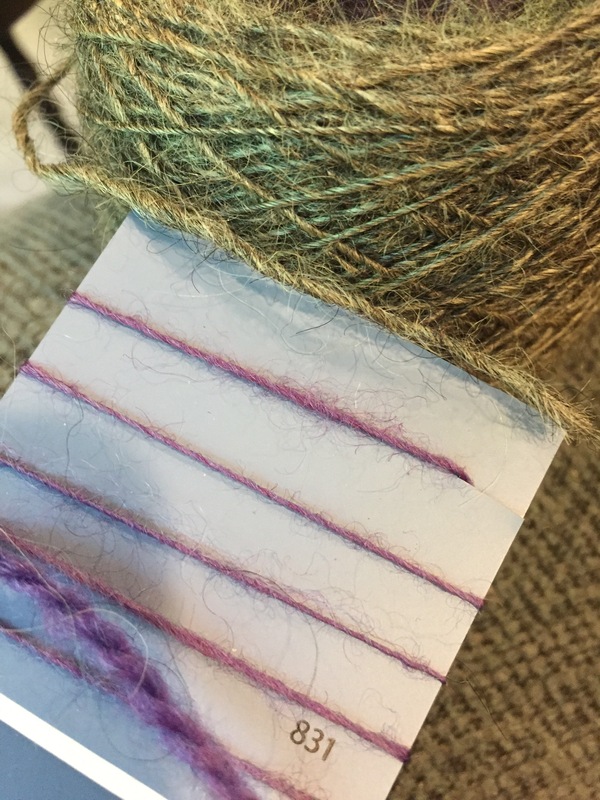 As in, I would think that I was spinning too fine, then I would compare it to my sample card and find I was spinning at the same thickness as the thickest part of my sample. That ended up being fine, because the BFL bloomed in the wash and the Gotland did not. Meaning even though the Gotland singles were thicker, the finished yarn is the same WPI. (Additionally, that meant it was denser, so less yardage.) But it seemed bizarre while I was spinning the singles. I kept the singles twist as low as I possibly could, because I wanted to have more ply twist, and it would take very little singles twist to make it ropey. In the end after finishing I had a ply twist of about 33°, which was still less then the BFL had, but was close enough that I think they will work together swimmingly in a project. Colour wise, I ended up doing the same thing that I did with the BFL: that is, I tried to line the colours up not quite exactly. This time I just stuck with the colour order of the batt, purple green yellow. In the final yarn, The colours actually lined up more than I thought they would, so I won’t see you that much colour play in barber poling. Oh well. I would have made myself nuts trying to control that any more. The other big color lesson? Grey Mutes Everything. It literally desaturates the colors. That meant that the two analogous colours – yellow-green and yellow-orange – were much harder to distinguish, and they all blend together more easily to the eye. In a split complement, that meant that the split part (the two analogous colors) acted more like a single contrast to the more distant complementary purple. Thought for the future: if assembling a split complement on greys, balance the colors more as if I were balancing two hues, not three, because that’s how they’ll act from a distance. Singles TPI of 5 with a ply TPI of 4 makes for a quite overtwisted yarn! It washed out to slightly overtwisted. Should be fine in the knitting. Prep: opened into two sheets, then stripped somewhat randomly; split into equal amouts for two bobbins, with a little extra purple on one for intentional slight misalignment of colours. Additional predrafting before spinning. Hairy and shiny at the same time! A fiber of contradictions. It’s pretty cool seeing the two skeins together. They are about as similar as I think I could have gotten them under the circumstances. But just from the length of the skeins you can see how much the BFL bloomed and contracted in the wash, while the Gotland just relaxed. We’ll see how they knit up together. I want to stripe them in a round yoke; I swapped around colors in the BFL so I could stripe them and have different colors together. I still need to get a main color for the rest of that project, though; I’m looking for that natural grey DK Gotland that Blacker Yarns makes, but it’s looking hard to find. It’s either that or buy some Gotland top to spin myself, which I’m not sure about. That was a very fun spin, and extremely fast after all my anticipation! It’s loads of fun seeing how everyone else’s yarn is turning out. 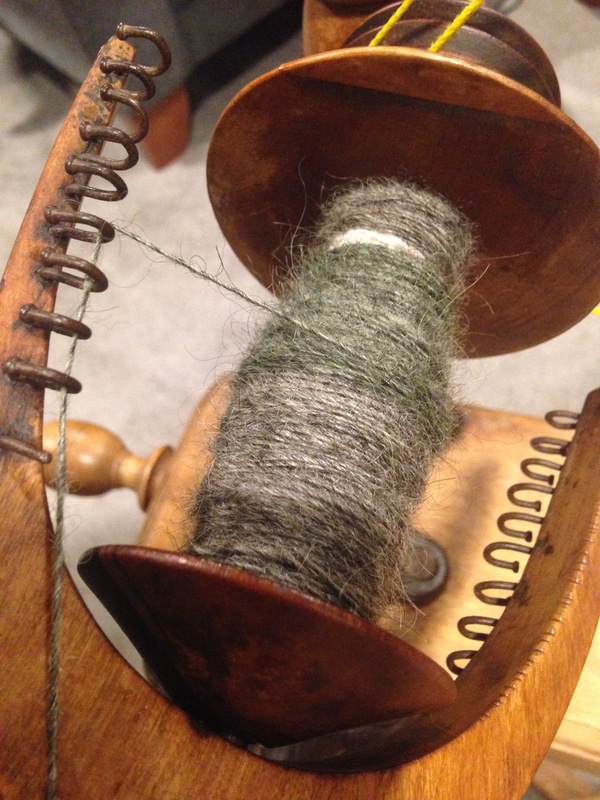 Participating in a global spinning project is something very special. Thanks for reading! A Priest Crafts – Episode 3: TDF is coming!